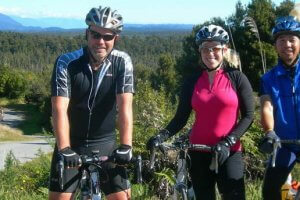 Guided cycling Tour New Zealand South Island short. From February 1 until February 10. We also offer this package in a 14-days -13 nights trip starting from Bluff in the deep south to Picton. This is a once in a lifetime opportunity. This beautiful New Zealand South Island Tour short program includes unique features, highlights and some fantastic climbs in the mighty Alps. Experience riding the rolling hills of the South Island of New Zealand as you prepare yourself to ride the “Queen Stage” from the dry mountains of Central Otago to the rainforest of the Wild West coast! 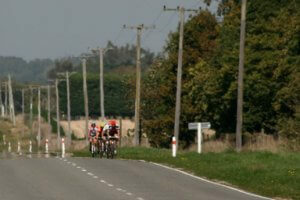 This tour has been specially designed with you, the passionate road cyclist in mind! This tour is open to cyclists of moderate to intermediate fitness level wishing to push themselves and experience new highs of achievement. Routes may include longer climbs and more technical skills. Beyond the included activities there also are some wonderful optional activities for you to choose from. On your free day in Franz Josef you can choose to book a half day hike on the Franz Josef glacier or you may even go for a helicopter ride! 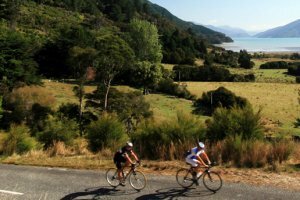 Bike the North region of the South Island, a wine country with rolling hills, beautiful coastal scenery, and the sunniest region in the country. Welcome to Queenstown, New Zealand's adventure capital. Depending on your arrival time, you could try a fly-cruise-fly package into the dramatic Milford Sound, white water rafting, jet boating, paragliding, or helicopter rides. You could shop in the pretty town center, or take an afternoon cruise on Lake Wakatipu on the steamship TSS Earnslaw. Or, head out for your first cycle ride: you can suggest good routes. Tonight you'll meet your tour guide and your fellow tour members, some of whom started the tour in the southernmost town of Bluff. First, a fairly easy ride to the historic gold mining town of Arrowtown, with just one real climb. 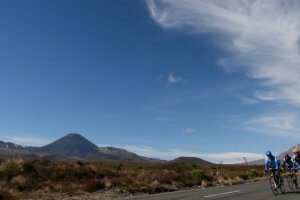 Then you head to the summit of New Zealand's highest highway (1080 m). It's a hard 3 km up steep hairpins, a flattish 5 km, then a lung-wrenching, leg-burning 3.5 km. Then it's ‘plain sailing’ as you follow the Cardrona River down to Wanaka, a popular lakeside resort town. Relax and enjoy local eateries and sights. There are also plenty of options for extra riding. A longer ride is in store today as you head west across the Southern Alps. The landscapes again change dramatically, from the dry, arid mountains of Central Otago to the dense rainforests of the wild West Coast. There will be numerous photo opportunities as you ride alongside Lakes Wanaka and Hawea and then over the glorious alpine Haast Pass. From here it’s a beautiful downhill as you follow the Haast River from its inception to the Tasman Sea. Heading north, you follow the rugged West Coast coastline for 30 km, with just one small climb before turning inland. Another little hill takes you to scenic Lake Paringa. A flat section through rainforest allows for some recovery until just before Fox Glacier at 120 km. 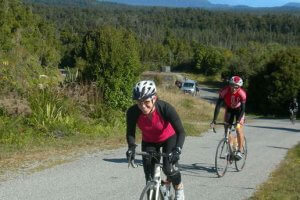 To round off a spectacular day you now have three steep climbs and descents for around 22 km to Franz Josef. The rugged coastal scenery and dense rainforest make today’s ride one of the most scenic of the tour. The perfect finish could be the Glacier Hot Pools, nestled in lush rainforest near the township's edge. A free day in this scenic alpine town surrounded by native rainforest. Relax, rest your legs and do as you please. Optional cycling is available, or you may choose to book a half day hike on the glacier, or go for a helicopter ride. Those Glacier Hot Pools with their natural glacier water may again be tempting. There's a flat to slightly undulating ride up beautiful West Coast roads today. Most of the route is slightly inland. The only hills are a short climb over Mt Hercules on a very scenic, winding bush-clad road. There are also small undulations around Pukekura, home of the Bushman’s center and some ‘tall tails’. Hokitika is a pleasant town known as the Heritage and Cultural center of the West Coast. Here you'll find New Zealand’s finest pounamu (local jade). Continuing north, it’s a reasonably easy flat ride along the coastline for around 82 km to your rest stop at Punakaiki. It's spectacular layered 'Pancake Rocks' and Blowholes at the coastline are a must-see. 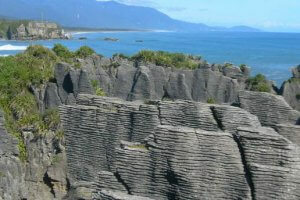 Punakaiki is also the gateway to the 30,000 ha Paparoa National Park. Then it's on to Perpendicular Point and Pakihi Hill with their great sea views before descending into the port town of Westport for a hard-earned pint of their local Miner’s beer. After following the stunning coastal road for 3 days, you now head inland on a gradual climb. You follow the Buller River past Fern Arch and Hawk's Crag, a tunnel blasted through rock in 1900. You pass the small towns Inangahua Junction and Murchison to Kawatiri. Then you turn off onto a quiet road and cycle northeast to the alpine village of St Arnaud, in the Nelson Lakes National Park beside Lake Rotoiti and the towering Mt Robert. Today is your longest cycling day and while you cycled gradually for the entire 158 km, it's only to 700 m above sea level. Through forest and then farmland, you cycle down the long Wairau Valley to the outskirts of Blenheim, centre of one of New Zealand's major wine regions. At Renwick, a meandering back road leads to Havelock, a charming little port town on the edge of the beautiful Marlborough Sounds. 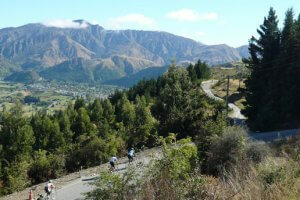 On your final 30 km of the winding coastline to Picton you see some of the most beautiful scenery in the region. It's a great finish to your last cycling day. After 940 km of great riding it's time to pack up the bikes and bid your farewells. If you're travelling to Wellington and the North Island, the ferry terminals are close by, and the airport at Blenheim is an easy transfer. For those who wish to return with us to Christchurch, the support vehicle leaves mid-morning for the 5-hour drive via Kaikoura and the East Coast. Departure day transfers : for those who wish to return to Christchurch, our support van leaves mid-morning for the 5-hour drive via Kaikoura and the East Coast.